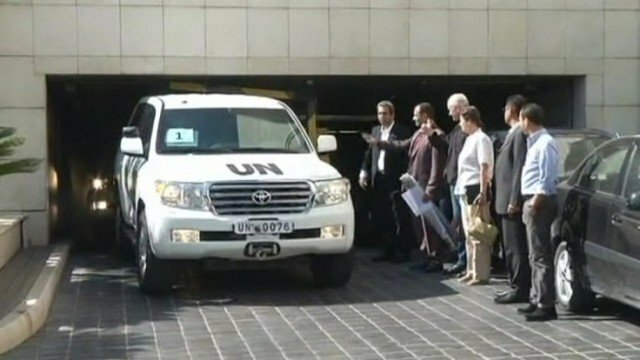 UN inspectors are investigating at least three alleged chemical weapons attacks in Syria that happened after August 21. Little is known about the latest three alleged attacks, which the Syrian government asked the UN to investigate. The August 21 attack left hundreds dead; the resulting outcry led Syria to offer up its chemical weapons arsenal. Inspectors are due in Syria next week – the UN will vote on the visit later. In Syria itself the violence goes on. Activists said a car bomb killed at least 20 people near a mosque in Rankus, a town north of Damascus, just after Friday prayers. In a statement, the UN said its current inspection team in Syria is investigating seven allegations of chemical weapons use this year. The team, led by Ake Sellstrom, arrived in Syria for its second visit on September 25 and hopes to finish its work by Monday 30 September, the statement said. It is working on a “comprehensive report” into the allegations that it hopes to have finished by late October. The UN listed the alleged attacks, which all took place this year, as Khan al-Assal on March 19; Sheikh Maqsoud on April 13; Saraqeb on April 29; Ghouta on August 21; Bahhariya on August 22; Jobar on August 24 and Ashrafieh Sahnaya on August 25. Syria has pushed for the investigation of the three post-21 August incidents.